The changes to Part L came into force in April 2014 and In order to meet the standard the developer must design the dwelling to fall below the targets for carbon emissions and the heating and cooling demand required to maintain comfortable internal temperature levels. The calculation to achieve these figures can prove complex especially when comparing the benefits of each of the materials or systems against their cost and the benefit to the overall values. The correct choice of polystyrene panel for a particular dwelling or complete project is crucial to ensure that these targets can be achieved without overdesigning. CUBE6 are able to supply EPS panels to suit any target value required and, due to the range of panels available, can supply the most economic panel solution possible. 1. Arrangement and size of the precast beams – single beams, double beams, alternate layouts etc. 2. Size and shape of a particular house type. We design each floor in the most efficient way so that the installation procedure is kept as simple as possible. We will always design the most suitable panel for the entire site to ensure completion of all phases of a project is error free. With each quotation we will provide a full detailed design layout together and are able to provide costs for various U Values upon request. As the default figure makes it almost impossible to achieve the DFEE (Design Fabric Energy Efficiency) or the DER (Dwelling Emission Rate) without major and costly improvements to the house design, calculated or enhanced Psi values are an essential tool meeting energy efficiency targets. 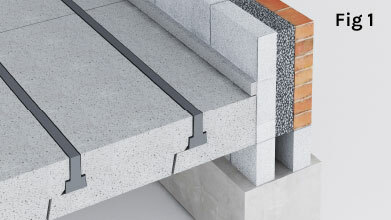 The Floor/Wall/Foundation junction can be a complex one but it is vital that it is designed using the most thermally efficient materials and in such a way as to minimise the heat loss. 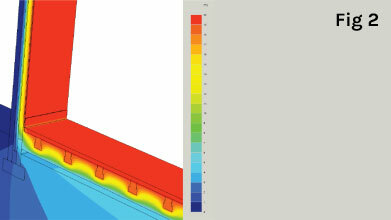 Approximately 25-30% of heat loss through the fabric of a house can be through linear thermal bridging and good detailing can contribute significantly to the carbon reduction required to meet energy efficiency targets. Please remember – a super insulated floor deck and wall do not compensate for a poor junction, indeed as the U values in the wall and floor elements get better the Psi value at the junction will get worse. Fig 2 – shows a thermal graphic of a junction designed to improve on default values in the Accredited Details. In order to prevent condensation the temperature at the corner needs to be no less than 0.75 of the temperature difference across the element. So in a typical case with an internal temperature of 20 °C and an external temperature of 0 °C the minimum temperature at the corner should be 15 °C. i.e in the graphic at the orange end of the colour chart.